“They have taken the Lord from the tomb, and we don’t know where they put him.” No one saw the resurrection; they saw that the body had disappeared. And then a new experience began to happen, appearances of Jesus in a body that seemed the same but also seemed very different. And not very long after that, even this body ascended into the clouds. It seems clear that our Easter to Pentecost Scriptures are leading us to understand the experience of being embodied as far greater than just this physical body we coax out of bed every day. The Epistles, which give us the beliefs of the first Christians before the Gospels came to be written, are quite clear that the body of Christ is expansive. This body of Christ is seated at “the right hand of God,” that is, at the end of time, while also being right here with us. This body is the union of us with one another through the Spirit given to us. Unfortunately we sometimes get the impression that our time-bound bodies are what will rise again. We don’t have good words to describe what our risen body experience will be like — except for that one word — unity. Somehow after death we will be united with, or embodied in, the very body of Christ. And you know, this already happens at every Eucharist. 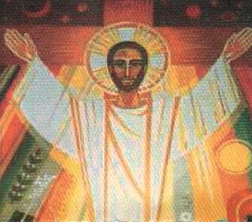 When the risen Lord joins his very self with the bread and wine, and we receive it, our own cells are infused with the special sacramental presence of Christ; his very body lives in us. I think that is the experience that best helps us picture life after death. Happy Easter!